After his team failed to direct a single shot on target in a scoreless first leg of their Western Conference semifinal, Vancouver Whitecaps head coach Carl Robinson rolled the dice with an attack-minded lineup in the all-or-nothing rematch. The gamble came up snake eyes. 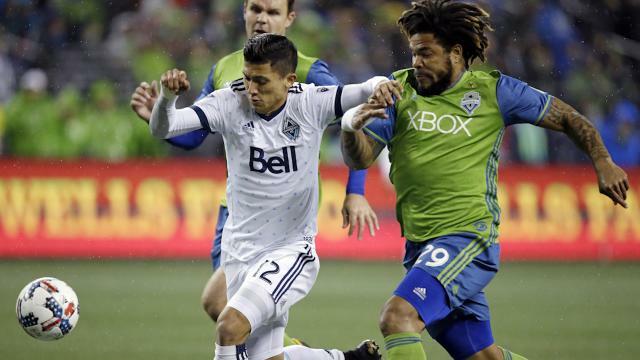 Clint Dempsey scored twice in the second half Thursday as the Seattle Sounders defeated the Whitecaps 2-0 to advance to the conference final and end Vancouver’s season. Offensive-minded midfielders Yordy Reyna and Cristian Techera, who could only sub on in the second half of the first leg because of nagging injuries, returned to Vancouver’s starting 11 despite Robinson’s assertions this week they probably wouldn’t be fit. But the pair looked more like bystanders than threats to score, while the Seattle stars like Dempsey and Nicolas Lodeiro grabbed the game by the scruff of the neck for the defending MLS Cup champions. Vancouver directed just one shot towards Sounders goalkeeper Stefan Frei, a weak header in the second half for its only effort on target over 180 minutes in the two-game aggregate series. Seattle, meanwhile, had five shots on goal and led Vancouver in attempts 20-7. The teams’ uneventful draw in the first leg at B.C. Place Stadium set a Major League Soccer playoff record for attacking futility with just one combined shot on target, which Seattle mustered in the second half. There would finally be a breakthrough early in Thursday’s second half at a cold and soggy CenturyLink Field when Dempsey beat Whitecaps ‘keeper Stefan Marinovic from the top of the penalty in the 56th minute following a clever back-heel from Will Bruin glanced off teammate Harry Shipp before landing on the boot of the U.S. international. The Seattle striker then iced the game in the 88th minute when he got in front of Vancouver defender Jordan Harvey, who subbed on in the first half for the injured Jake Nerwinski, and tapped in a cross from substitute Victor Rodriguez. Dempsey returned to the starting lineup after getting sent off in Seattle’s regular-season finale. The 34-year-old could have been banned another game or two for the elbow that resulted in the red card, or his sarcastic applause directed at the referee before slowly leaving the pitch, but escaped further reprimand. Robinson, whose team beat the San Jose Earthquakes 5-0 in the knockout round for the club’s first-ever playoff win, dodged a question post-game about whether Dempsey should have even been involved at all, choosing instead to applaud his ability. Seattle will now meet either the Portland Timbers or the Houston Dynamo in the West final. Those teams also played to a scoreless draw in the first leg, with the return match set for Portland on Sunday. After the Sounders went ahead Thursday, the Whitecaps needed an away goal to advance, with Robinson throwing on Alphonso Davies in the 64th minute in hopes the teenage sensation could provide a spark. Vancouver found a bit of life, and got its first shot moments later on a Christian Bolanos header that Frei stopped with ease, but a toothless attack offered little else going forward before Dempsey put things to bed. The Whitecaps lost at the same stage of the 2015 playoffs to Portland by the same 2-0 aggregate final, and have now failed to score a single goal in four conference semifinal games. “You just got to find better players,” Robinson said when asked what his team must do to get to the next level. ”I believe we’re in a better place than we were two years ago.